We added a new butterfly species to our yard list this morning. 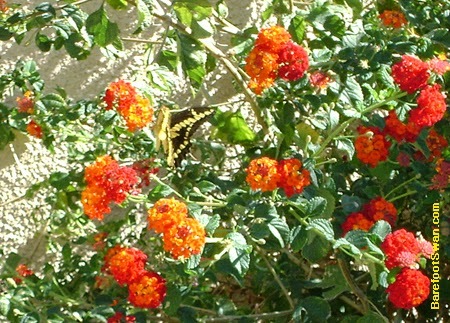 It was flitting around our red lantana bushes, and sipping nectar from the colorful flowers. The butterfly was very active - constantly moving and fluttering its wings. It did not alight to sip the nectar, but hovered as it dined. 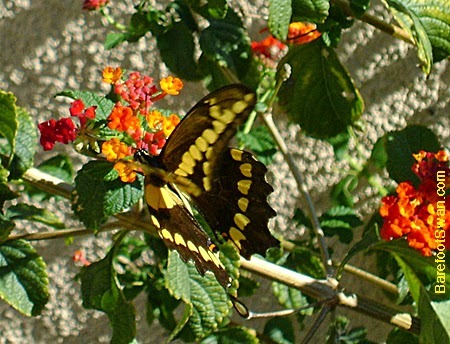 The butterfly was rather large, with mostly black wings that had rows of yellow spots in bold diagonal bands. Fortunately we had the camera with us, so we could take pictures and consult our Butterfly Guide. 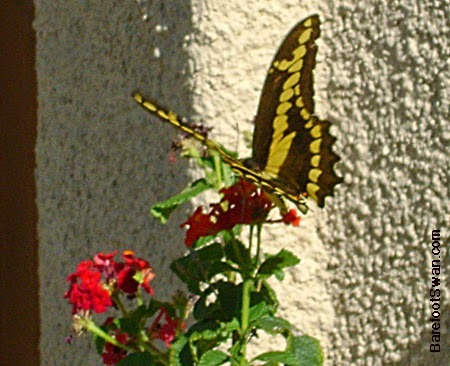 It was a Giant Swallowtail Butterfly, Papilio cresphontes. 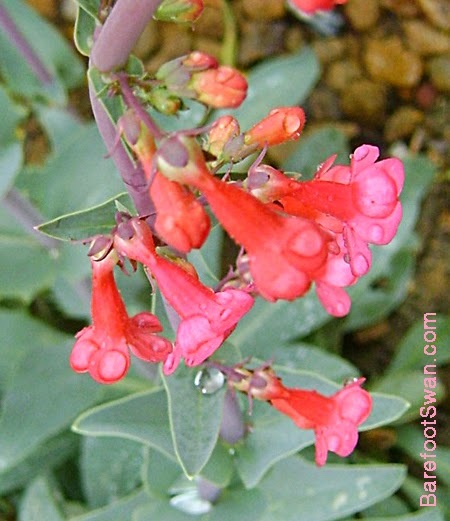 This beautiful Butterfly is found throughout most of North America, except for the northwest. 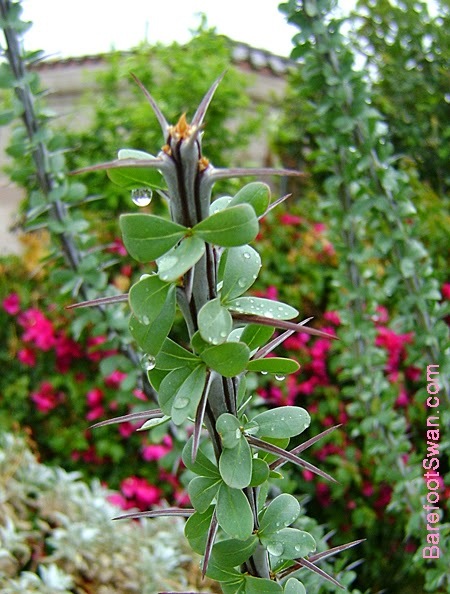 They may also range into Central America, parts of the Caribbean, and into southeastern Canada. Its wingspan can reach up to 6" from tip to tip, making it the largest butterfly in the U.S. and Canada. 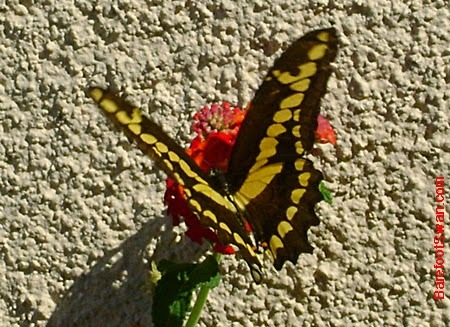 The large wings give Giant Swallowtail a very strong flight and the ability to glide long distances. 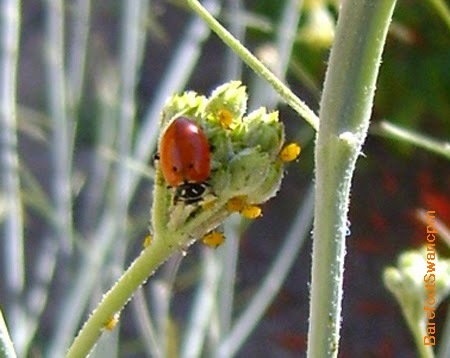 The female Giant Swallowtail lays her orange-colored eggs singly on the selected host plant. About 12 days later the caterpillars hatch out, eating the remains of their egg casing and then heading out in search of food. 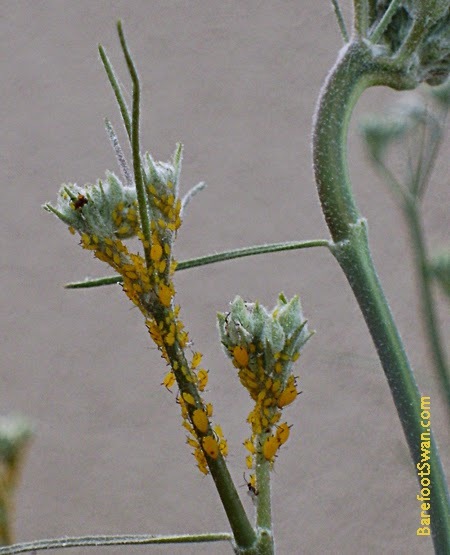 The young brown and white caterpillars look like bird droppings, and this camouflage helps protect them from predators. 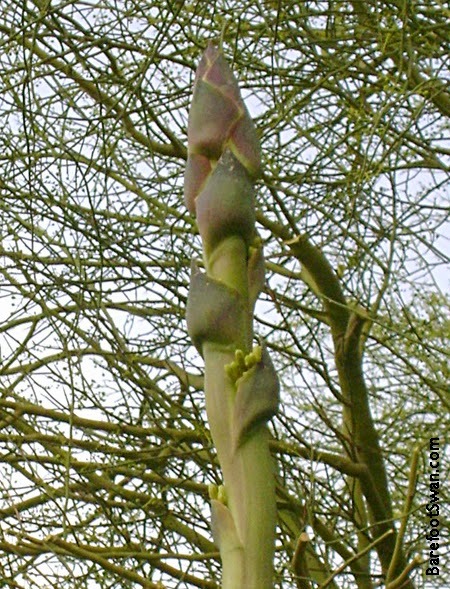 The chrysalis is a very plain mottled brown and looks like a broken twig. 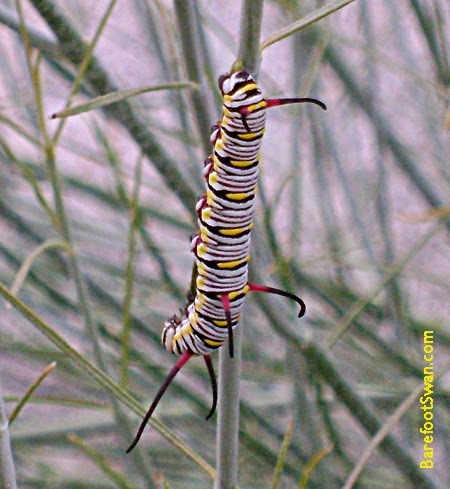 The caterpillars are considered pests in many commercial citrus orchards, where they are referred to as "Orange Dogs". 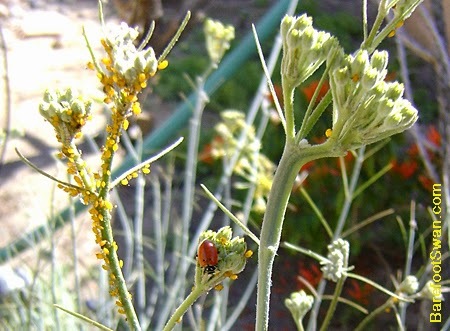 The hungry caterpillars can defoliate potted plants or small trees, damaging the plants and causing reduced crop yield. 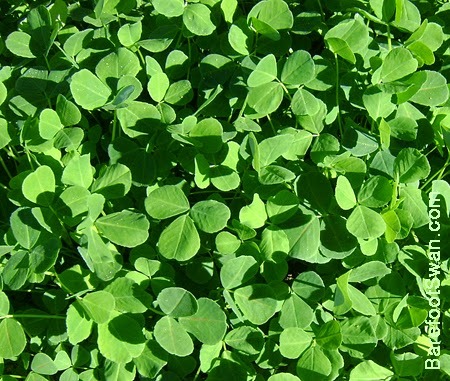 Providing suitable host plants in your yard can help these butterflies find a safe place to lay their eggs and ensure their offspring have enough to eat. 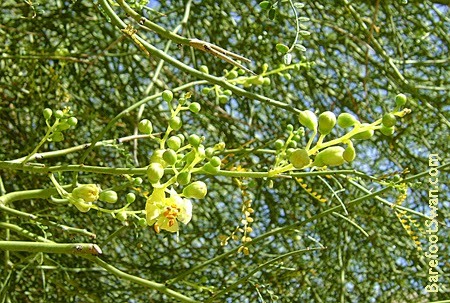 These host plants include the citrus family for laying eggs and caterpillar food (orange, grapefruit, etc. 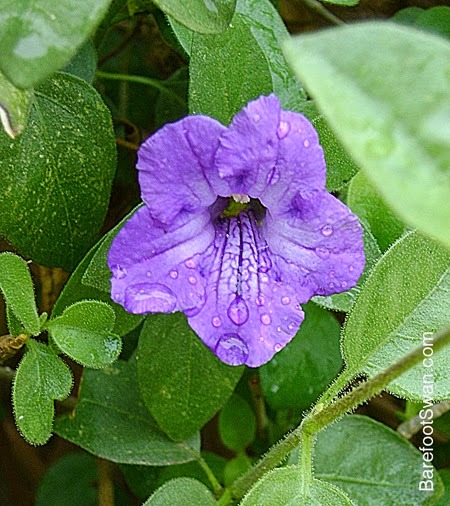 ); and lantana and bougainvillea for nectar. 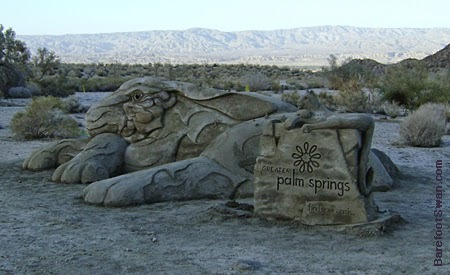 Last weekend we participated in the Coachella Valley Wildflower Festival, in Palm Desert, CA. 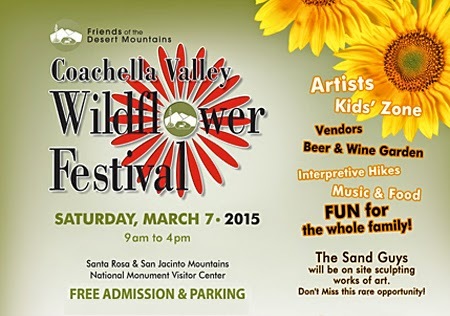 The event, sponsored by Friends of the Desert Mountains, was held at the Santa Rosa and San Jacinto Mountains National Monument Visitor Center, on Highway 74 just south of town. 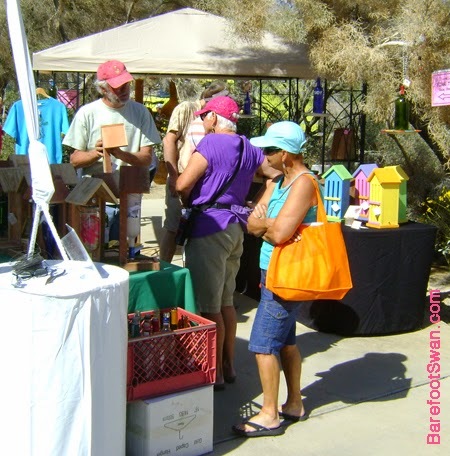 This is the fifth year Barefoot Swan Nature Arts has attended as a vendor. The weather was perfect and sunny, with a steady and enthusiastic crowd throughout the day. Sales were good and we enjoyed talking to people and sharing tips for improving (or starting) a backyard habitat in their own yards. 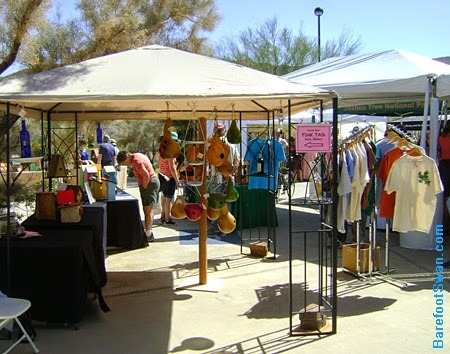 We brought our handmade Bird Houses, Bee Houses and Butterfly Houses as well as a brand new item: Hanging Plate Bird Feeders. Our Recycled Bottle Bird Feeders continue to be a popular item, both in our online Etsy Shop and at events like this. 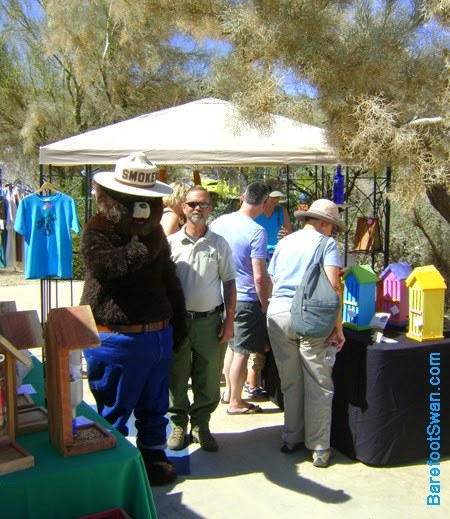 In addition to nature-themed vendors there were also guided hikes, live music, a wine garden, lots of kids activities, food vendors, puppet shows, and more. 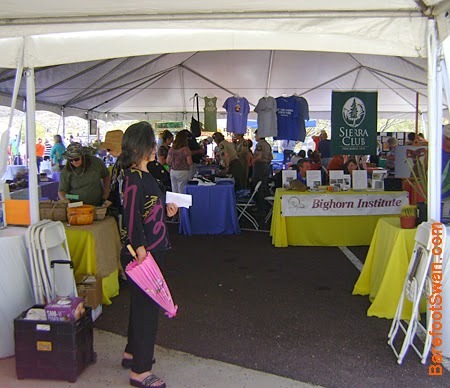 A HUGE tent featured displays by some of the area's non-profits that support the protection of our desert and its wildlife. This provided a really good opportunity for visitors to learn about the conservation work being done locally. There was also a giant raffle, with over 70 items donated by Festival vendors and local businesses. 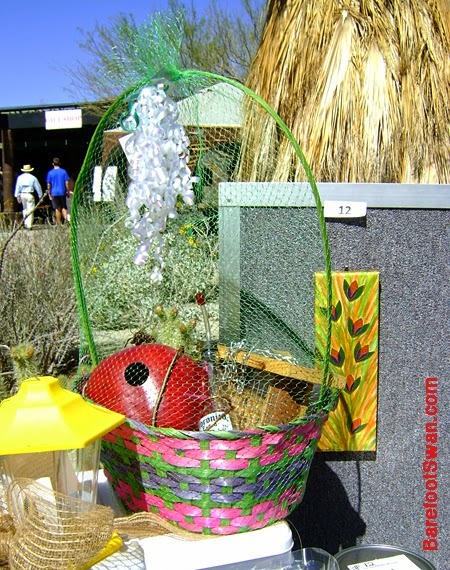 We contributed a colorful "Bird Lovers Bonanza Basket", which contained a Red Apple Gourd Bird House, a hanging Suet Feeder, a Suet Block and one of our Coronita Hummingbird Feeders. 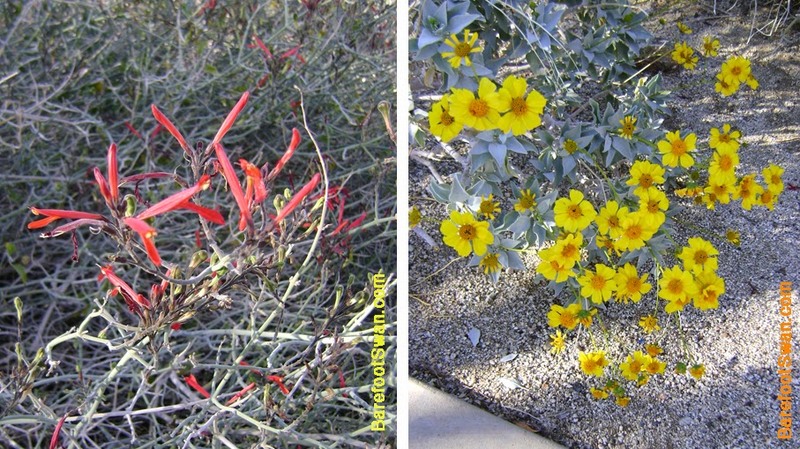 Some of the blooming plants on the Visitor Center grounds included red Chuparosa, which is especially loved by hummingbirds, and bright yellow Encelia. 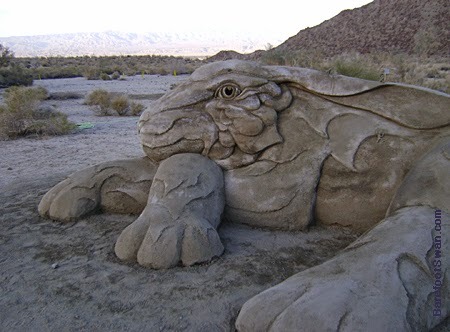 And although we didn't get a chance to watch the actual construction, The Sand Guys (from the Travel Channel) were at the Festival and built a beautiful giant sand Jackrabbit at the Festival entrance. We hope it will be there for a long time, so future visitors will be able to enjoy their creative vision. 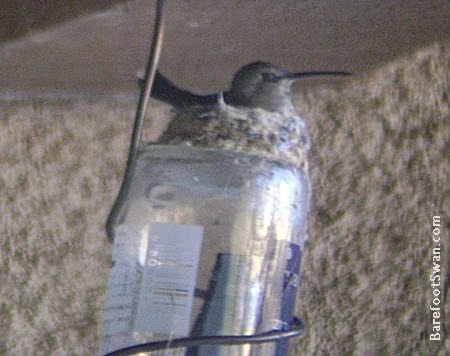 A female hummingbird has built her little nest on our back patio. 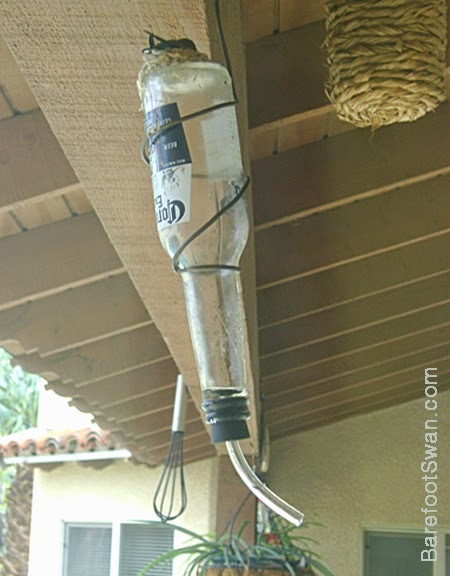 She placed it on top of one of our hummingbird feeders, which is tucked up high under the eave of our patio cover. The nest is right outside our bedroom window. We took some pics when she had her back to us. She finished her nest over the weekend - bringing bits of spiderweb and fluff, and carefully placing each beakful inside. 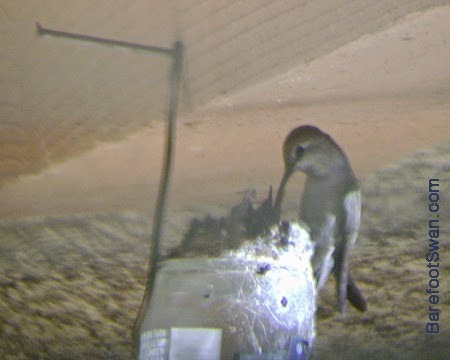 She then shaped it by turning in circles inside the nest. A few days later when she was off-nest, we very quickly checked the nest with a mirror held overhead and saw there were 2 tiny little eggs inside. We decided to set up our field scope inside the house, in our kitchen. Lately we have been watching her through the opposite window on the other end of the patio. At first we thought this was a strange place to build a nest. 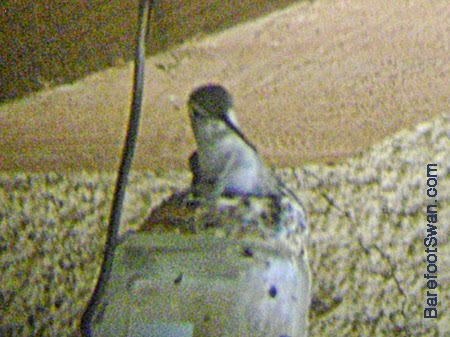 Besides the obvious (on top of a hummingbird feeder? Really?) it is a high traffic area that we walk past a couple times each day. Since we noticed her there, we have been walking all the way around on the far side of the pool, to give her some space. But she actually made a pretty smart choice. 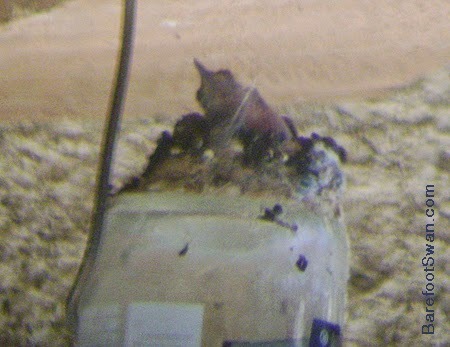 -- The nest is protected on 2 sides by nearby walls, and above by the roof. -- She is sheltered from the elements. She stayed dry during the last rain. And after the rainstorm came through, we had some gusty winds that gave her a bit of a ride on the hanging feeder. But nothing like it would have been on an unprotected tree branch. -- It is close to a food source. 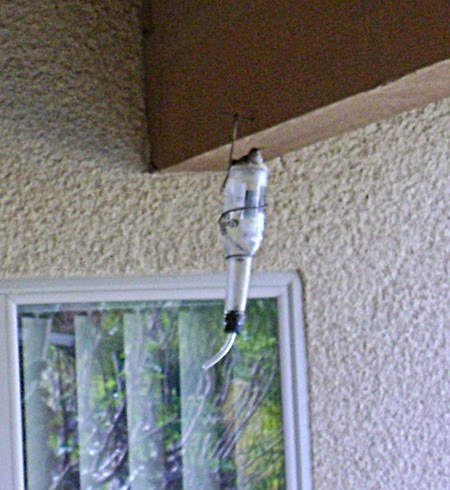 There is another hummingbird feeder about 15 feet away. She allows other hummers in the yard to use it, but when she comes over to feed she is pretty territorial. -- She has a good view of both the hummingbird feeder and her favorite off-nest perches. 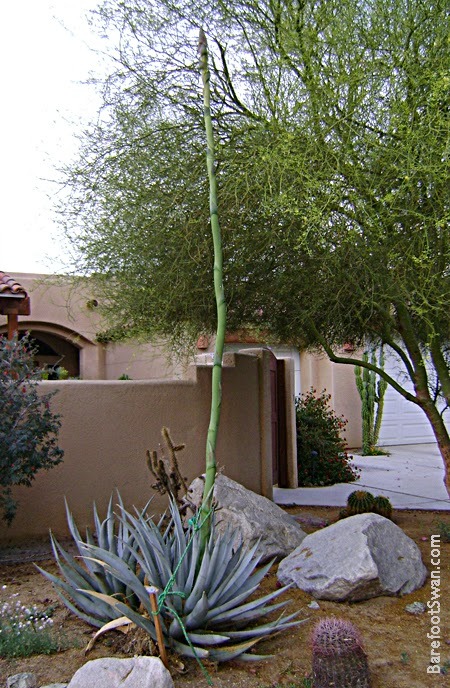 -- It gets morning sun, but is protected from the afternoon sun. -- The walls and roof hold residual heat, to keep her a little warmer at night. It will be interesting to watch our smarty-pants hummer as she raises her babies. as the nest of a hummingbird. The finding of one is an event." Another storm brought light showers throughout the day today.